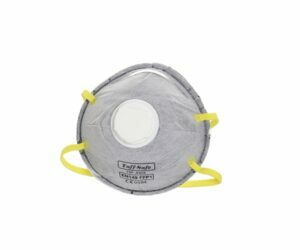 A maintenance free mask layered with active carbon protection and exhalation valve that filters against dust of low toxicity, noxious and contaminant particulates, liquid aerosols and effectively traps organic chemical vapors particulates within the activated carbon filtered layers. It is useful for humid and high temperature working environment. Releases heavy built-up of hot air within interior breathing space and prevents against inhalation of organic vapors such as acetone, solvents, aromatic hydrocarbons, butyl and alcohol.